You want high-tech Penn quality, the kind of heavy-duty performance needed to win a knockdown, drag-out battle with the toughest fish in blue water? 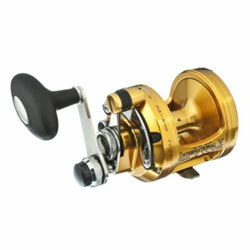 Then the Penn International VSX is your reel. The VSX is equipped with Dura-Drag which can handle the extreme drag settings associated with fishing super-braid, yet it maintains incredible smoothness throughout the entire drag curve. For hard-charging fighters like marlin, tuna, and bull dolphin, the International VSX gives you the best shot at a trophy! ""This is by far one my top 5 saltwater reels. I have caught sailfish, blue marlin, white marling, bull dolphin, and a few BIG Blue Fin Tuna with one about 183lbs. The retrieve is smooth, the drag seems that it will never fail, and when I let a fish run, the line burning offsounds just beutiful. " "this is a great reel for offshore i have caught amberjacks on this which is a fun fish to catch"
"I bought me an International 16VSX 2 speed a couple months back, strung with 80# big game and went out for test. Almost immediately hooked into a 90# yellowfin, reeled it in with ease! I also fought a 400# blue marlin with, reel worked beautifuly for the whole four hr fight. Theres nothing better then PENN!"